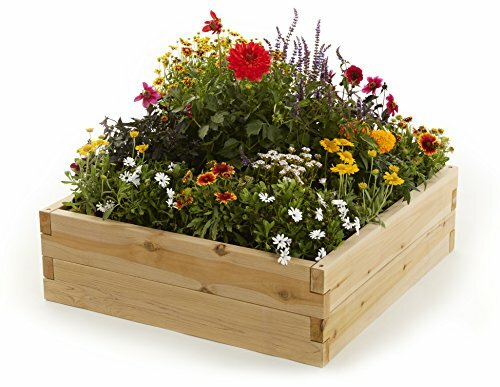 Build a durable raised bed planter with this easy, tool free kit. Assembly takes just minutes. No tool necessary. Raised beds are made from 1.5 inch thick kiln-dried cedar protected by a non-toxic silica-based sealant that is safe for vegetable gardens. Choose from three different sizes, in standard or rustic grade cedar. Enjoy long-lasting raised beds, season after season, with a 30-Day Satisfaction Guarantee and 5-Year Limited Warranty. Assembled dimensions: 35.7" W x 35.7" L x 11" H; holds 6.8 cubic feet of soil. Made in the USA.